Nissan is setting up one of their most diverse lineups in time for the 2015 Tokyo Motor Show. They are rolling out the latest in their familiar fleet like the Gripz concept (which has been shown off since late 2014 before being driven by auto publications just last month) and a new updated Leaf. 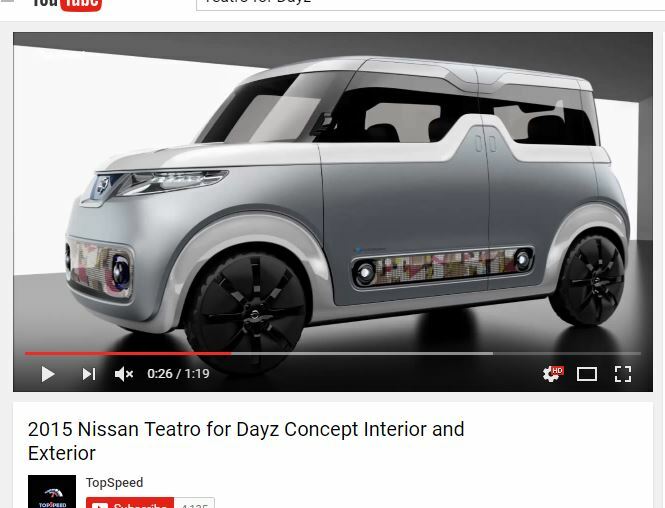 In addition to those, perhaps Nissan’s biggest debut is the long gestating Teatro for Dayz concept: a quirky car that imagines the ultimate vehicle aimed at younger drivers. 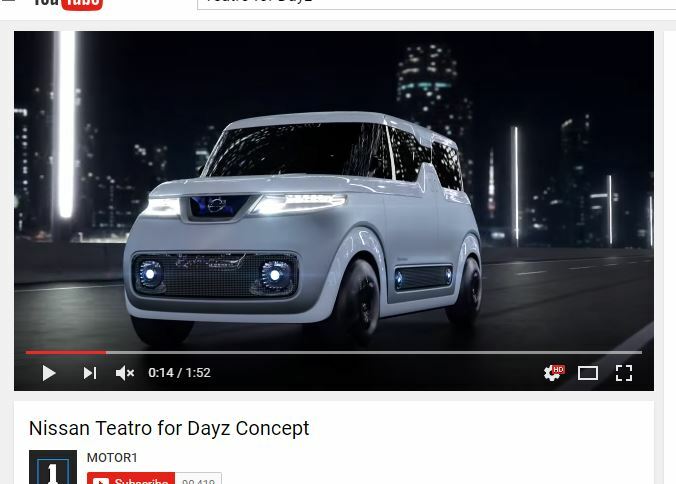 In their press release, the Teatro for Dayz is designed for the so-called digital native generation – basically those with the Internet widely available from birth. On the outside, the EV concept actually looks of a piece with Nissan’s Cube with a boxy, angular shape. Unlike the Cube, the oddly named concept wears some of the brand’s current styling cues like the V-shaped grille and LEDs slashing through the headlights. The squared-off rear features taillights running all the way across and lower lights that echo the ones in front. The interior is just a simple expanse of white with front and rear bench seats. Most notably is the interior layout that is designed to allow social-media-obsessed occupants to express themselves through digital displays. Designed especially for the digital native generation “that went straight from the cradle to digital technology as ‘share natives'” (the demographic born from the early to mid-2000s until today), this vision of near-future vehicles departs from convention and marks a shift in perception for the brand. The mobile device and social media addiction of our times have already caught up with automakers, but Nissan dares to ask: what if a car was specifically designed to cater to the needs of what we’d call the Digital Generation? 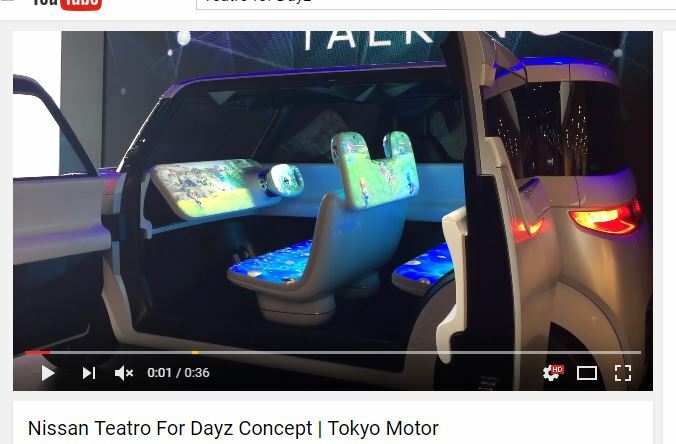 The ‘Teatro for Dayz’ will make its world premiere at the 2015 Tokyo Motor Show that will run from October 30 through November 8. The press calls it a “mobile device on wheels” and as so, the ‘Teatro for Days’ is a small, battery powered car. “In addition to being compact, mini-cars remind them of the handy mobile devices they carry in their pockets,” says Sasaki. “Share natives are already accustomed to recharging their devices at home, so EVs fit their lifestyles far better than cars that require regular visits to a gas station.” This car marks its evolution from being simply a replacement for the recently discontinued Cube. So, Nissan’s designers packed the exterior, but even more so, the interior, with customizable screens. On the outside, you get LED displays on both bumpers and the doors, allowing users to express themselves through dotted images and words. However, it’s the cabin that takes the mobile device theme to extremes. When in drive mode (think of it as the equivalent of ‘Airplane Mode’, it’s a minimalistic looking two-tone, black and white interior with meters, controls and maps appearing on a pure white screen – also, notice the ‘play’ and ‘pause’ designated pedals. Put the car in park mode, though, and a third of the interior, including the dashboard panel, the (uncomfortable looking) seats and even door trim, become a live display – akin to skins on phones and tablets. From concept to interior and exterior design, Teatro for Dayz is simple: a clean canvas. When the car is in drive mode, meters, controls and maps appear on a pure white instrument panel. When parked, Teatro for Dayz transforms into an entirely new device. The entire interior, starting with the instrument panel, becomes a live display for a generation wired for connectivity. Teatro derives from the Italian word for theater. It is easy to picture share natives making Teatro for Dayz the center of an impromptu outdoor festival, or embarking on serious new-generation gaming fun complete with top-quality sound. Teatro for Dayz’s user interface is based on freedom. When the car is not in drive mode, all the driver sees is a steering wheel, an accelerator and brake pedals. As information illuminates on the white instrument panel, the driver can freely adjust the size and position of the meters, gauges and car navigation information on the instrument screen. Unnecessary information can be hidden. The solid white interior suggests infinite possibilities for display. As technology evolves and share natives contribute ideas through feedback, the variety of ways the interior could serve as a digital native theater will expand.